In medium bowl, mix sour cream, mayonnaise, garlic, lime juice and salt. Add cabbage and red onion; toss to coat. Cover and refrigerate cabbage mixture until ready to serve. Cut 8-inch round of cooking parchment paper. Place in bottom of air fryer basket. In shallow dish, place taco seasoning mix. In another shallow dish, beat egg and water. In third shallow dish, place bread crumbs. Coat fish with taco seasoning mix; dip into egg mixture, then coat with bread crumb mixture, pressing to adhere. 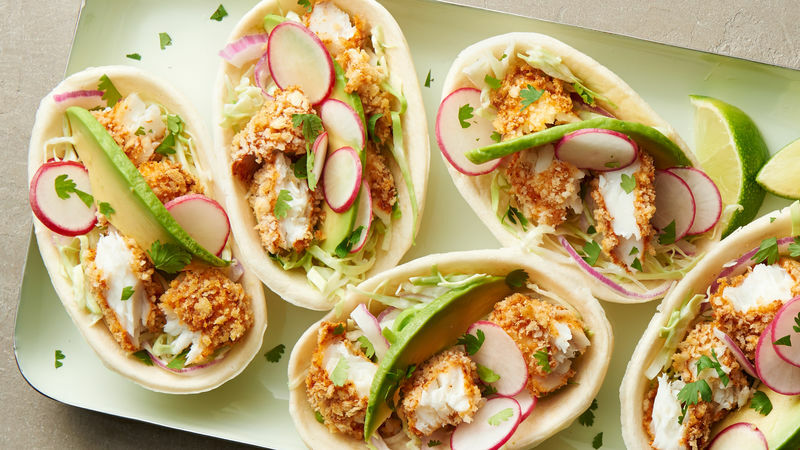 Place fish on parchment in air fryer basket. Set to 350°F; cook 8 minutes. Turn fish; cook 4 to 6 minutes longer or until fish flakes easily with fork (at least 145°F). Cut fish into bite-size pieces. Divide cabbage mixture among taco bowls. Top with fish, then top with avocado, radishes and cilantro. Serve with lime wedges. Air fryer temperature control settings vary according to brand and model. If your air fryer does not have the exact temperature setting called for in the recipe, consult your manual for suggested temperature settings. For even more flavor, top with [Yum Yum Sauce]. Be gentle when turning fish to prevent pieces from falling apart.